Thanks to the easy and fast set up of WooCommerce Newsletter plugin you can send professional newsletters to your customers in no time. The integration takes over the automatic synchronization of your contacts and allows you a 1 click product transfer of your products in your newsletter. WooCommerce plugin enables you not only to create emails, but also track them in real time. For example, you can see how many subscribers have opened the email and clicked a link. You also have access to Conversion Analysis so that you can easily control your ROI. What sets us apart from the other guys is that we offer email marketing whitelisting, which raises delivery rates. All of our servers are whitelisted, which gives us an impressive 99% delivery rate. By contrast, the effectiveness of manually sent email campaigns drops below 50%. Once the WooCommerce plugin is installed and set up, your recipients and their attributes are regularly synchronized with your WooCommerce shop. With the receiver and segmentation, you can easily use the relevant data, including all features for your newsletter distribution. Our email marketing software allows you to effortlessly increase customer retention and multiply your email marketing-driven revenue and sales generation. For E-commerce companies this is a particularly important feature if you wish to write to and address a high number of contacts in a targeted manner. Lifecycle email marketing is the secret for pros who want to increase their Return On Investment (ROI) even more. Furthermore, the latter can also be measured with our conversion tracking feature. 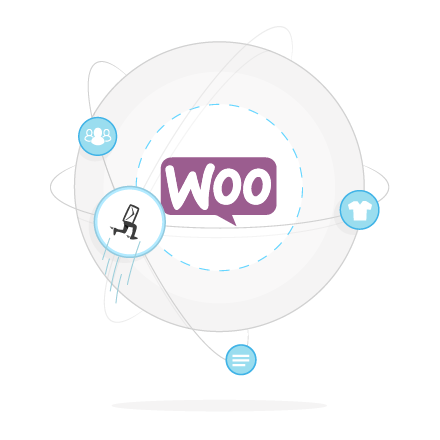 With your WooCommerce plugin set up, you add in not only customer data, but also products from your WooCommerce Shop. If you’d like to take advantage of this option, then all you need to do is to get a customized newsletter. Our programmers will take care of all the setup so that you could easily insert your products into the newsletter. Once you enter the product ID then desirable product data will be automatically imported straight into your newsletter. Newsletter creation and WooCommerce plugin integration is handled in no time.